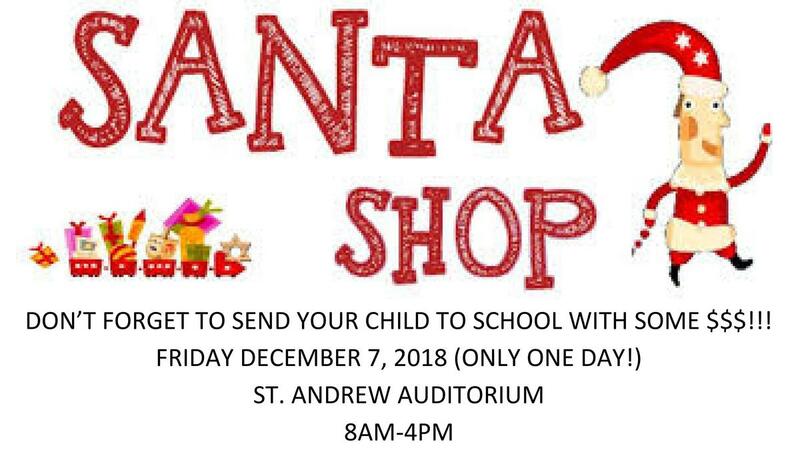 Santa's Shop is Coming to Town! This Friday, December 7th is St. Andrew's Annual Santa's Shopping Extravaganza for our students! DON’T FORGET TO SEND YOUR CHILD TO SCHOOL WITH SOME MONEY SO THAT THEY MAY HAVE AN OPPORTUNITY TO BUY PRESENTS FOR THEIR LOVED ONES! FRIDAY DECEMBER 7, 2018 ONE DAY ONLY!